Did someone say BACON?! Cooked in maple syrup?! SIGN.ME.UP. 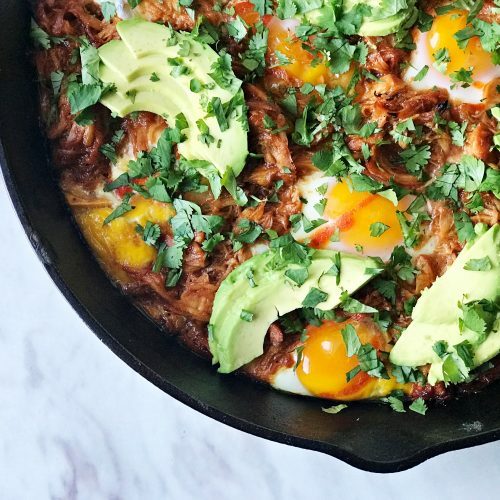 Guys…this recipe is SO SO easy and totally drool-worthy. With only two ingredients involved, this should definitely find its way into your brunch menu. Wether it be an addition to a Bloody Mary bar, or served all on its own, it’s always a favorite at our house! For the bacon…the trick is to get thick cut bacon, because once its baked in syrup it will be nice and juicy! And when cooked properly, it will be firm enough to hold itself up if used in a Bloody Mary or placed in a mason jar! For the maple syrup…I get a 100% pure maple syrup, which means that there is only one ingredient…maple tree sap that has been boiled down to syrup. This is so much better than using pancake syrup, which is an imitation syrup made up with artificial ingredients, and added sugar. 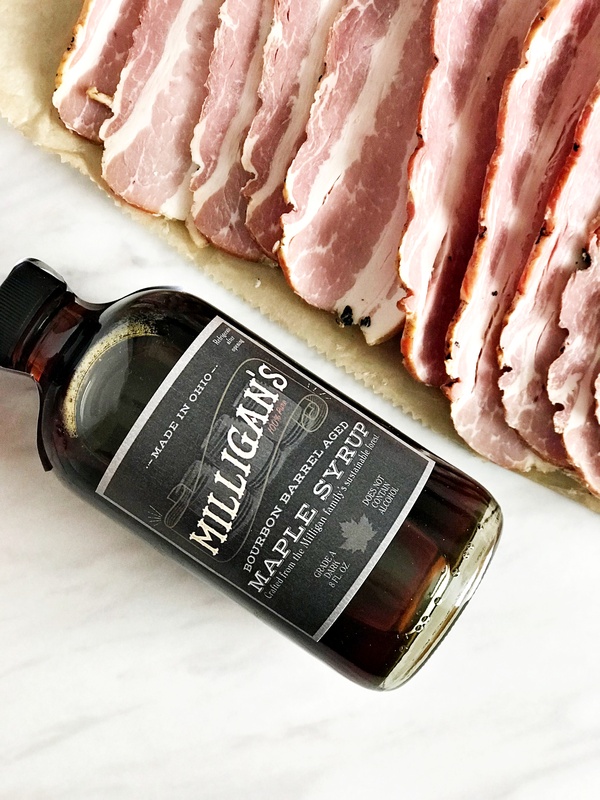 We use a local Ohio syrup, Milligan’s Bourbon Barrel Aged Syrup, because it’s 100% pure, organic maple syrup tapped from a sustainable forest in Athens, Ohio! 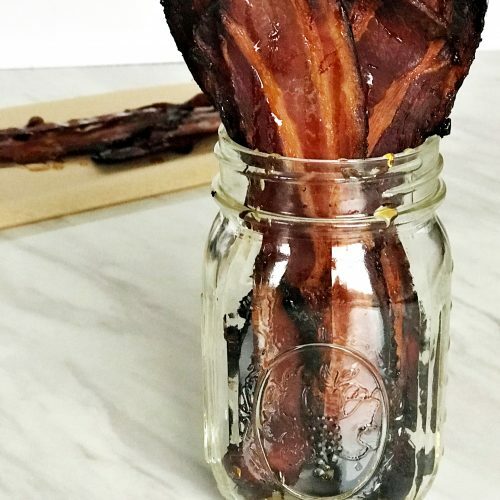 So how do we make this divine fancy bacon? 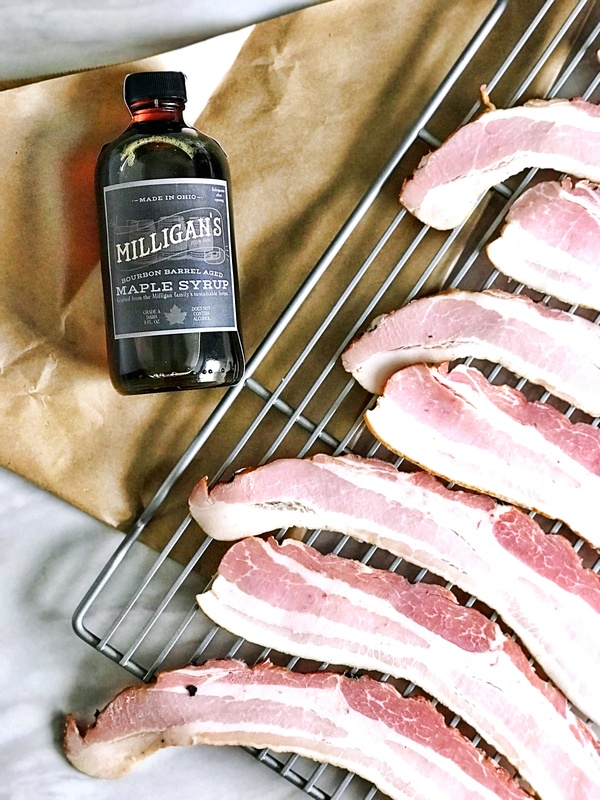 First step is to coat your bacon with syrup, both front and back. I use an OXO Basting & Pastry Brush to coat the bacon (also great for coating other meats before baking). 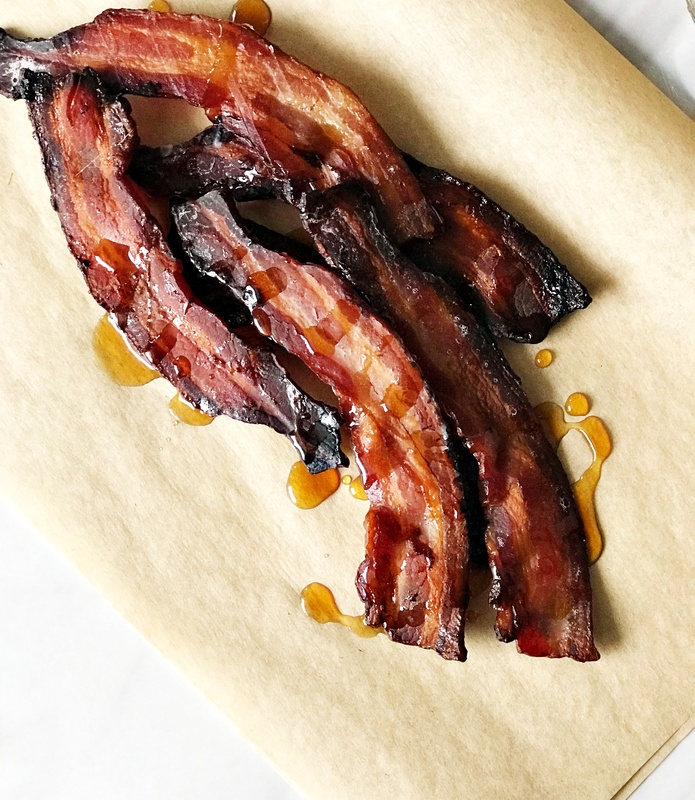 After coated in syrup, lay bacon strips on a parchment lined baking sheet, and bake in a 400 degree F oven. Bake for 15 min, before flipping and baking for another 15 min. Once your bacon strips have cooled, drizzle with extra syrup and serve! I love to serve mine in a mason jar or as an ingredient on a Toast Bar ! 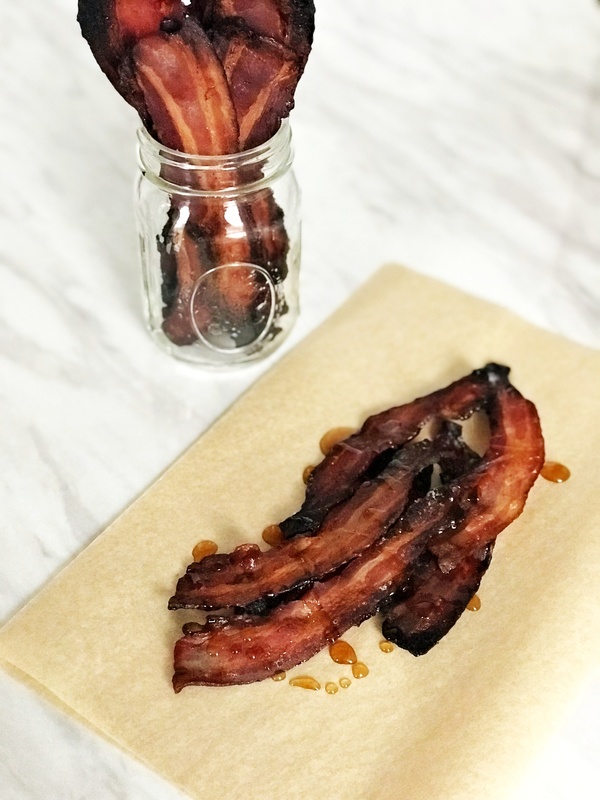 Thick cut bacon covered with maple syrup for a sweet and savory snack. Great for brunch, or fun for a Bloody Mary bar! Brush maple syrup over front and back of bacon slices and line on baking sheet. Bake for 15 min, flip bacon slices using tongs, and bake for another 15 min. Drizzle with extra syrup before serving. 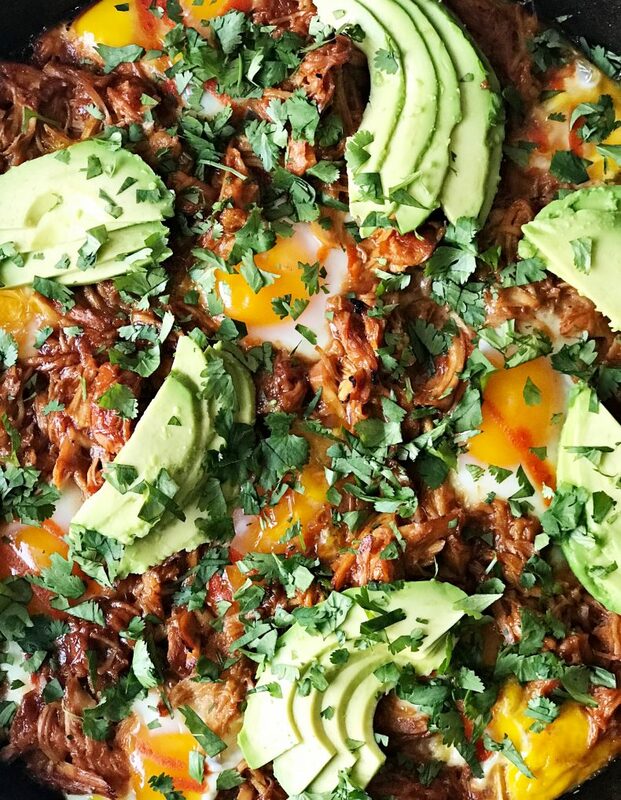 Looking to have some fun with your brunch menu this weekend? 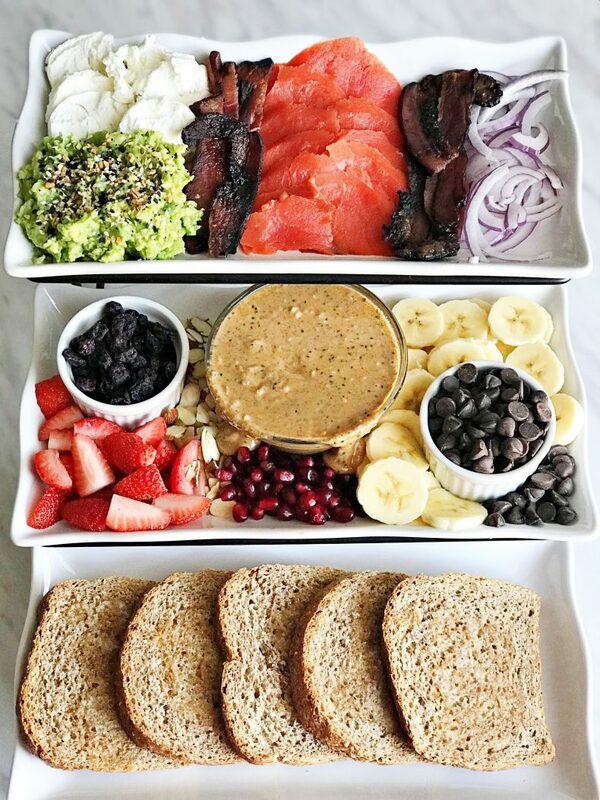 Try this TOAST BAR on for size! If you’re anything like me, I have a very hard time deciding between sweet or savory when scouring a brunch menu. Do I go with the eggs benedict sitting atop 10 glorious pounds of bacon, or the super chocolatey chippy powdery sugary pancakes…the agony of brunch decisions is real my friends! Lucky for me, my husband goes through the same mental torture, but nips it in the bud by ordering one of each (therefore I get to pick at his, mwahaha). But fear no more, because you can do both with this Toast Bar! There will be no compromise at this brunch affair! Not only does this remove the anticipation of the ever torturous decision, but is way way better for you then going out for a restaurant brunch. You have the flexibility to put out the ingredients you want and to make it your own. Have fun and crazy is always encouraged! For the meantime though, I’ll give you a breakdown of the SWEET & SAVORY TOAST BAR! Always, always, always have an ooey, gooey, drippy nut butter. Melt beforehand for added yumminess. 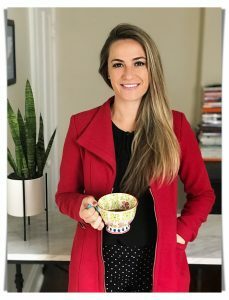 I tried a new nut butter mixture the other day called NUTTZO, and ended up falling in love and using in this recipe! 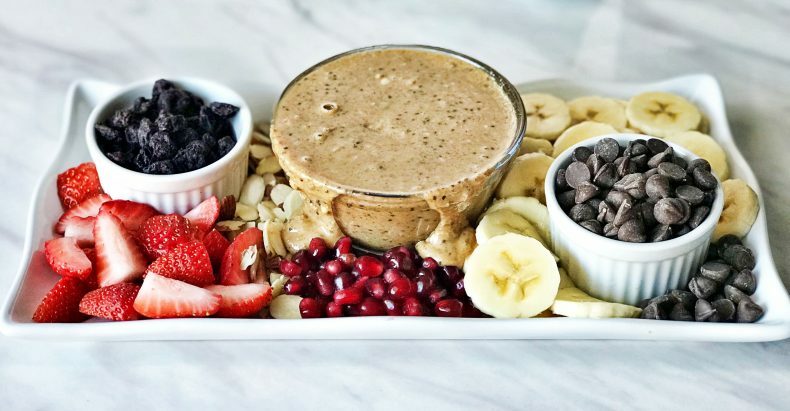 It’s this beautifully and organically crafted nut and seed butter with only top notch ingredients and nothing extra added to it. So heck yeah, I smeared that all up and down my toast. Get yourself some fruit! I used dried blueberries, fresh strawberries, sliced bananas, and pomegranate seeds. Sprinkle on toast liberally. Chocolate. Need I say more? I love me some dark chocolate, so thats what you’re looking at here. 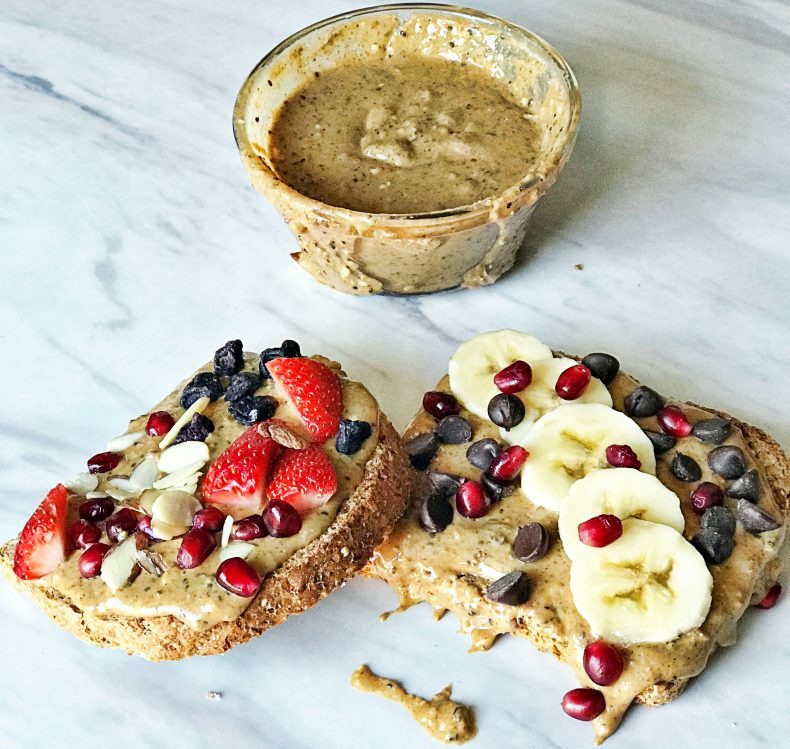 Also, this may be a super underrated combination, but the nut butter, with chocolate chips, and pomegranate seeds was AWESOME. The pomegranate seeds add a pop of strong flavor that blend so nicely with the dark chocolate. Give it a try! Nuts for texture! Almond slices are one of my favs, but you could also do chopped walnuts or pumpkin seeds, yummmm. (In Arby’s song) We have…the MEATS. So I don’t know if I’m going through a phase, but I’ve been having a real obsession with lox since Christmas. I for real cannot get enough of them. 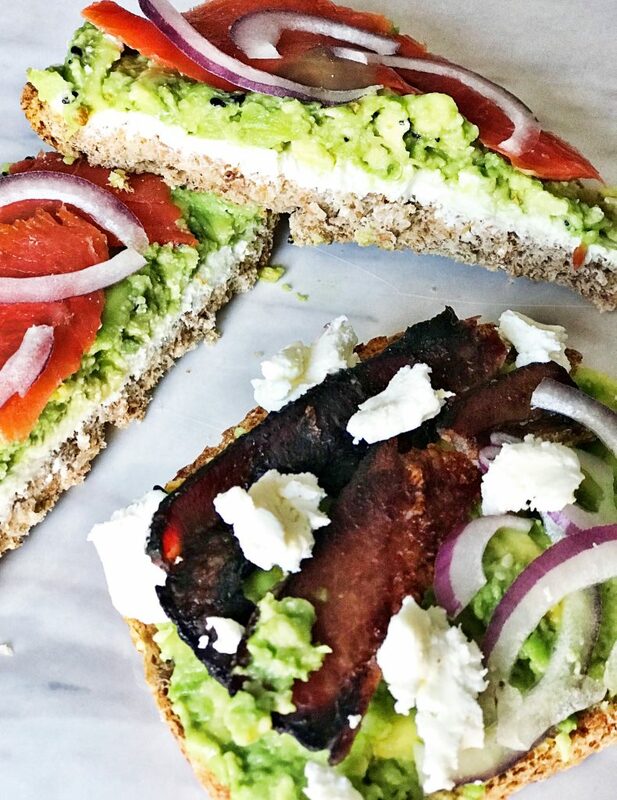 And if I’m being honest, my cravings for lox is what prompted this toast bar brain child. So thank you, you briney, smokey salmon filets for being so darn delicious. Also, bacon makes a great toast topping, so cook you up some strips. Cheeeeeeseeeee. I used goat cheese, for its spreading abilities, taste, and its health benefits over cheese made from cow’s milk; such as, easier digestion, fewer calories, and higher vitamin content. 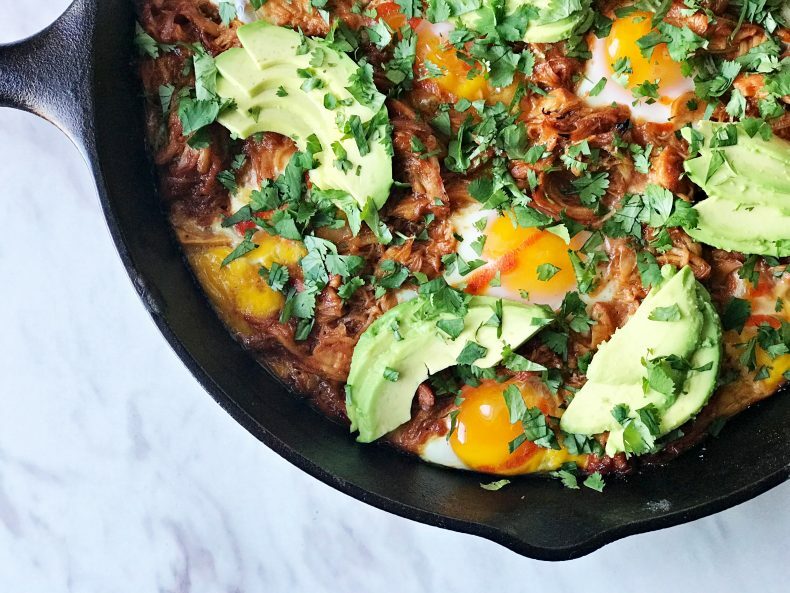 Avocado is a must have for the savory side. Mash it up, whisper sweet nothings to it, drizzle some lime juice for flavor and freshness, and then sprinkle with Trader Joe’s Everything But the Bagel seasoning. If you haven’t tried this seasoning yet, you are doing yourself a real disservice. Go get yourself and bottle and put it on EVERYTHING. Well if you’re having lox then it goes without saying that you need thinly sliced raw red onion too. Serve with many slices of toasted and buttered sprouted grain Ezekial Bread and then step back to admire your masterpiece. With that, I think you’re ready to go off into the world of brunch and host your own toast bar. Make me proud and knock it out of the park! Set out 3 decorative trays, or 1 large tray to use for Toast Bar. 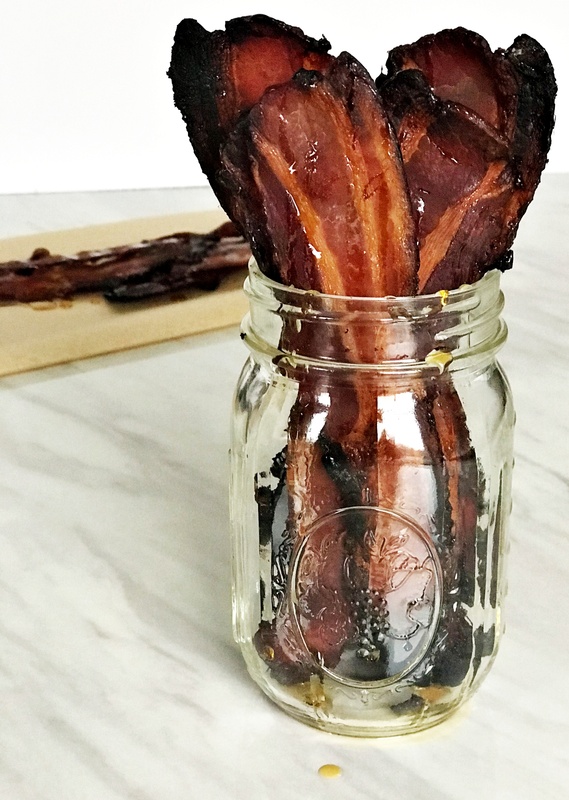 Start cooking bacon on stovetop. If using one large tray, separate ingredients with slices of toast. Set up sweet tray with ingredients. Use small bowls to hold blueberries and chocolate chips. In a larger bowl, heat nut butter until it becomes warm and runny. Set up fruit and almond slices around bowls. Set up savory ingredients. 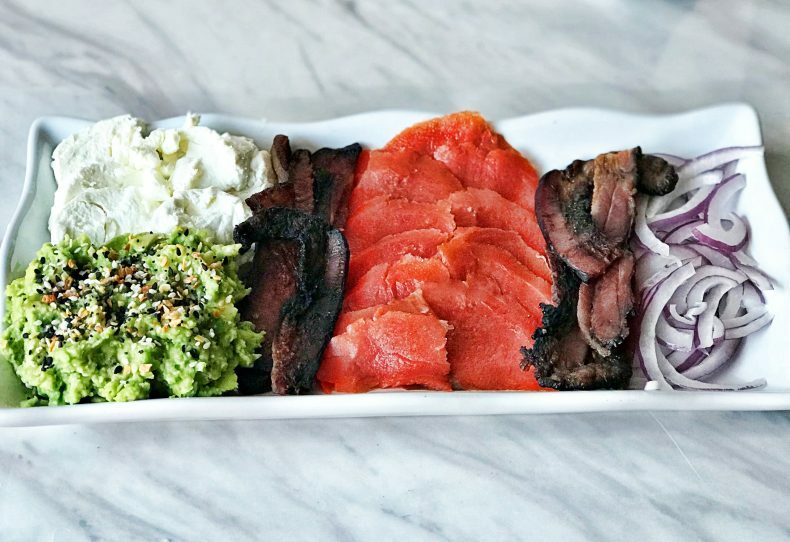 Arrange lox, sliced onion, and goat cheese on tray. Take avocado and scoop flesh into a bowl. Mash with a potato masher and then drizzle 1 tbsp lime juice over top. Scoop out and arrange on tray, then sprinkle with TraderJoe's seasoning. Toast and butter bread before serving. 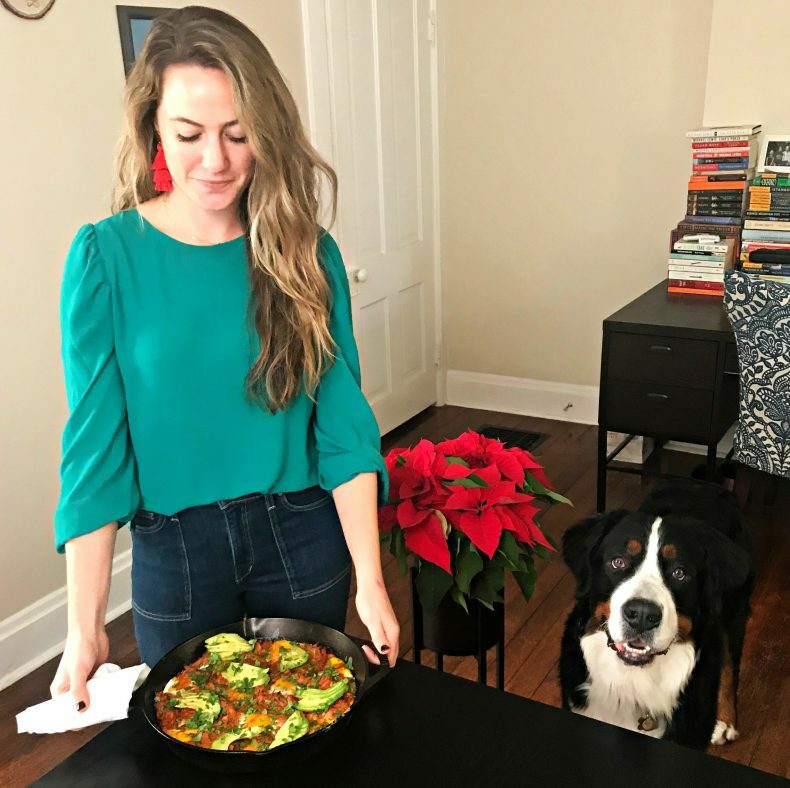 Anyone in need of a healthy Christmas brunch idea?! Cause this is where its at! 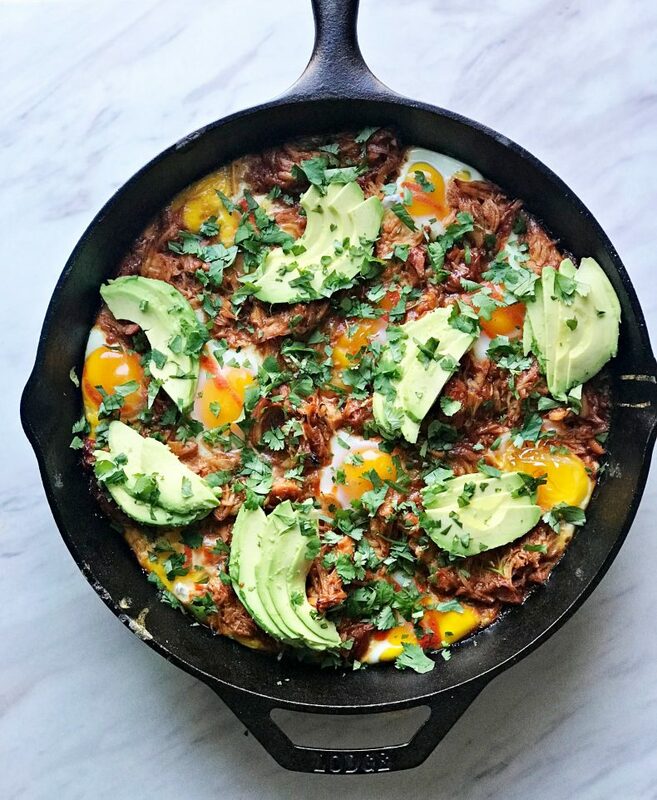 A giant dish full of sweet potatoes, eggs, and BBQ pulled chicken, all baked together in marital bliss! This really doesn’t require all that much effort, just a little planning ahead of time for the chicken, but can easily be thrown together before the Christmas chaos ensues. Cause as we all know, the kiddos need fuel to sustain their energy while opening gifts! The base consists of a sweet potato hash, which is a combination of cubed sweet potatoes mixed with chopped onions and some spices. 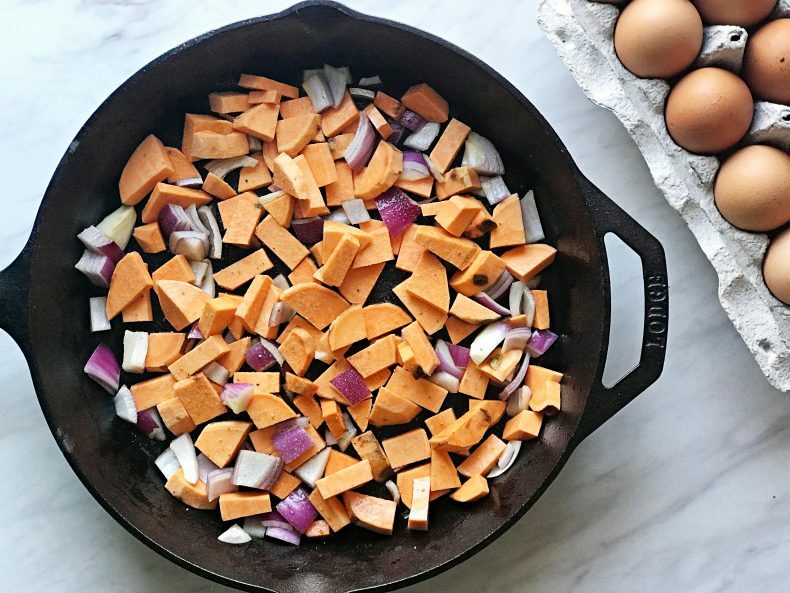 Bake the sweet potato hash to soften up the veggies and then crack the eggs directly on top. Add some pulled chicken before throwing back in the oven, and then top with all the goodies! In order to save me some time, I made my super easy Easy Slow Cooker BBQ Pulled Chicken the night before, stored in the refrigerator over night, and then added it directly to the skillet before baking the next day. 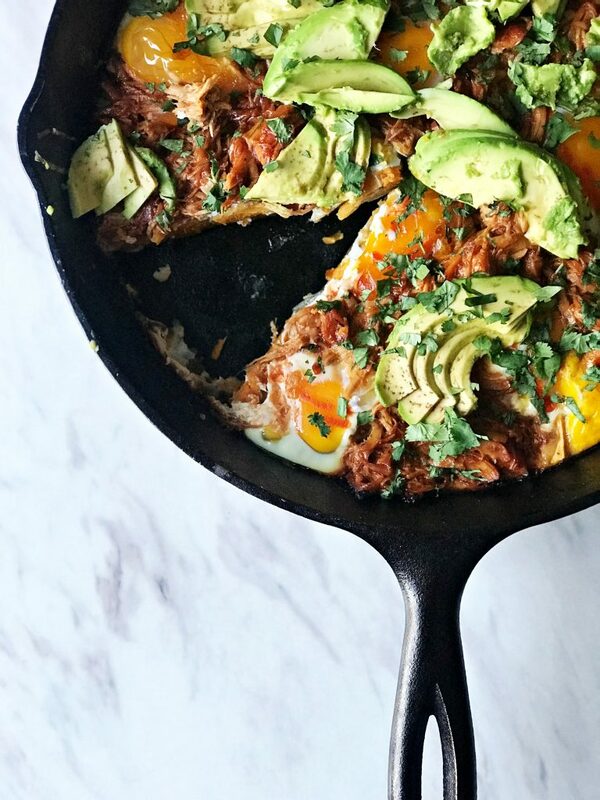 You’ll likely second guess this is good for you, because it’s entirely too yummy, but its actually quite nutrient dense AND gluten free (holllllaaaaaa)! The egg and chicken are a strong source of protein, while the sweet potatoes offer a variety of vitamins and healthy carbs. Adding avocado will provide healthy fats and increase absorption of fat-soluble vitamins found in the sweet potatoes. Starting your day off with a nutrient dense brunch always makes me feel better about all the Christmas cookies I let myself eat later. Because balance, right? 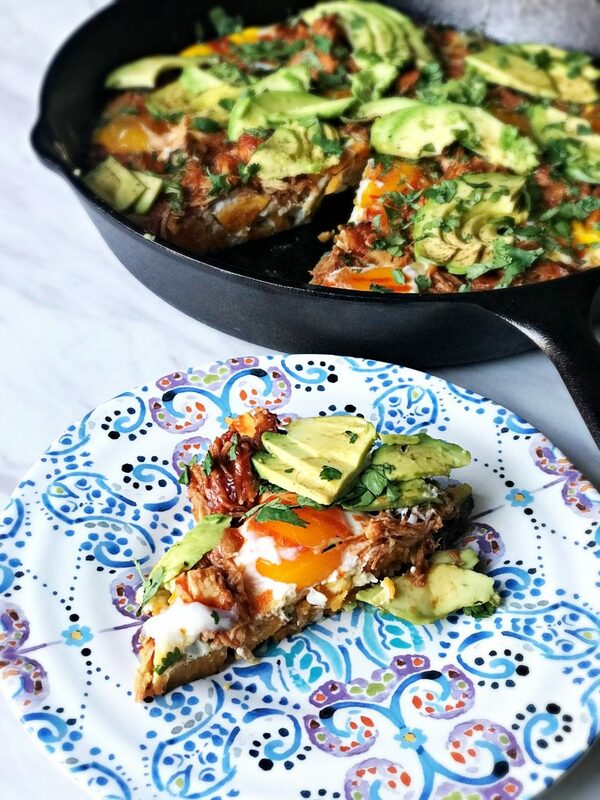 Easy, one pan egg bake with healthy bbq pulled chicken and sweet potato hash. 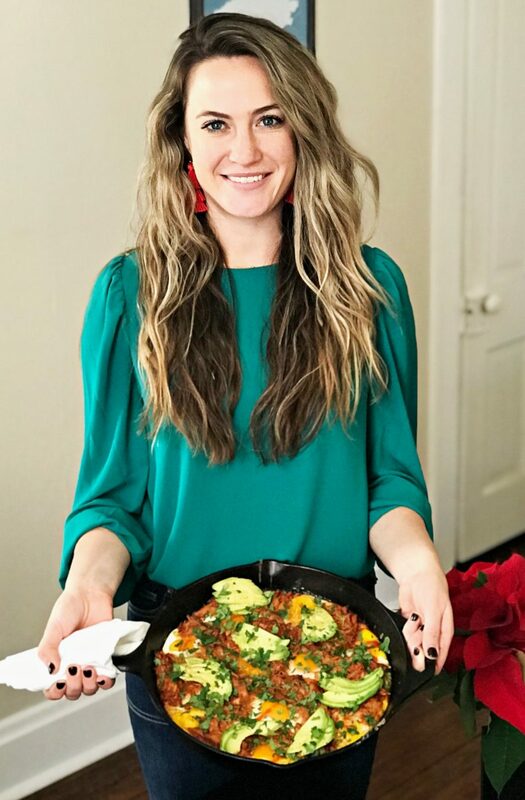 Topped with sriracha, avocado, and cilantro! Peel and cube sweet potatoes and chop onion. Throw into skillet or baking dish. Add oil and mix well, making sure to coat veggies thoroughly. Sprinkle a thin layer of salt, pepper, and garlic over top of veggies. Bake for 30 min. Crack eggs over sweet potato hash so that it covers the entire dish. 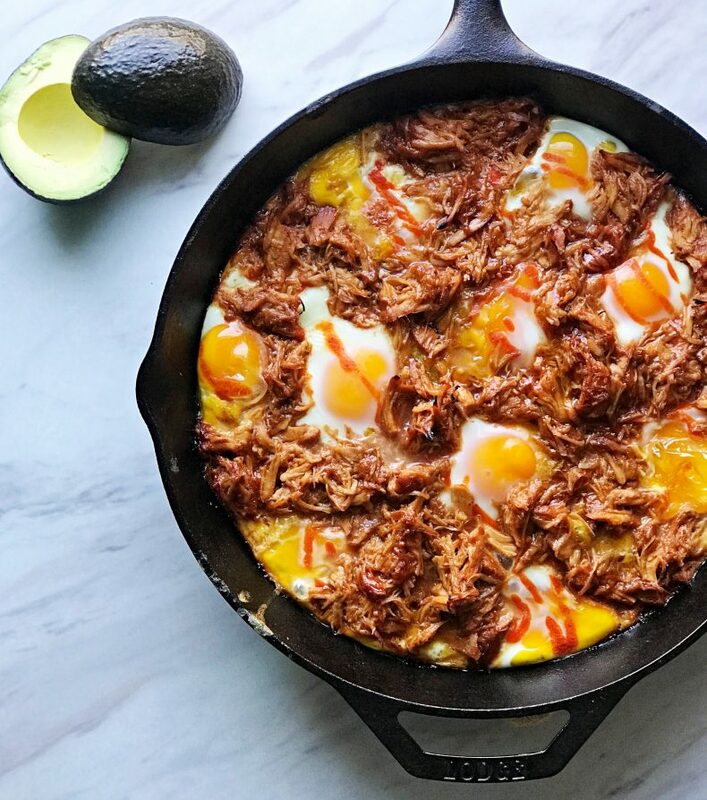 Drizzle sriracha over eggs (optional). Layer on BBQ pulled chicken, and bake for another 30 min. Top with sliced avocado and garnish with cilantro before serving!